Arizona Clarifies Just Compensation Owed in Eminent Domain When Owner Loses Driveway Access to Public Street — Sammartino Law Group, P.L.L.C. In City of Phoenix v. Garretson, the Arizona Court of Appeals has clarified the law regarding the just compensation a condemnor must pay for restricting a property owner's access to an adjoining street as a result of taking a portion of the property through eminent domain. 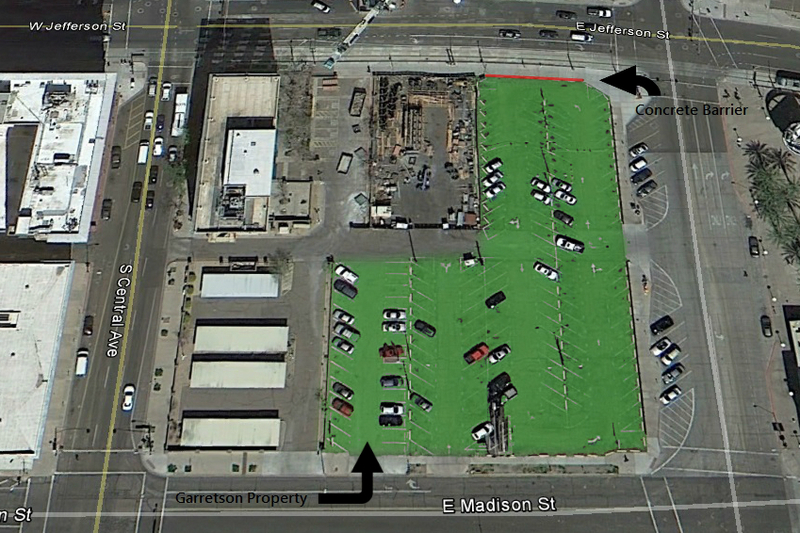 The Garretson property is located in downtown Phoenix, and the City of Phoenix took a temporary construction easement along the north boundary of the property to construct the Phoenix METRO light rail. Garretson claimed that he was owed money because, in constructing the light rail, the City blocked Garretson's driveways onto East Jefferson Street. The Garretson property in downtown Phoenix. The City off Phoenix raised arguments that previous Arizona cases have suggested that a property owner is owed no money for loss of access unless the remaining access is unreasonably circuitous. Arizona has also suggested destroying such access is allowed pursuant to the City's police powers and therefore noncompensable. The Court of Appeals dispensed with the City's arguments, which is a victory for private property owners. Now there is no ambiguity in Arizona law regarding the circumstances in which a condemning authority must compensate a property owner for restricting access to a public street. Congratulations to Mr. Dale Zeitlin, of Zeitlin & Zeitlin, P.C., who represented Mr. Garretson.